Two gruesome murders have shocked and divided the community of Bella Coola, a small, isolated village in a remote river valley on the coast of British Columbia. The evidence points to a teenaged Nuxalk boy, and the simmering tension between whites and tribe members heats up. 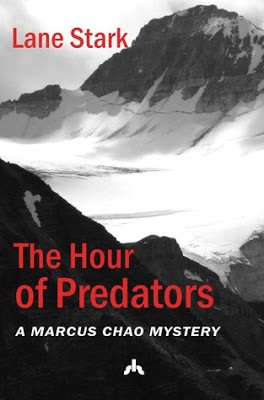 RCMP Inspector Marcus Chao must sort through misleading clues, cultural conflicts, tangled relationships, sexual scandals, and even rumors of sorcery to find the truth. The Hour of Predators was my first crime thriller. No joke. I'm a fantasy and romance fanatic so maybe that's why it took me so long to finish this book. It took months and it wasn't because of the writing. The writing was IMPECCABLE. AMAZING. MAGNIFICENT. Stark's talent for creating such vivid imagery with words turned a 3-star plot into a 4-star review. The plot, overall, was just okay. There was an element of fantasy in the story, but in the end, I felt this took away from the mystery, rather than added to it. What I mean to say is, I would have loved to have read this book without all of that. If I say too much more, I'll probably spoil the book. Throughout the story, the plot dragged in many places and I had to make myself keep reading. I felt there were too many unnecessary scenes and interactions, but that's probably just me being picky. For the characters, I really only liked the detective, Marcus and his ex-wife, a linguist named Gemma. At times, I found myself more engrossed in their troubled relationship than the murder mystery, which says so much about how "romantic" I am. Stark did well not to make them a bigger part of the story. She must have known people like me would forget what they were reading. I didn't become invested in the other characters like I wanted to. There was Daniel, and of course, Claire, and for them to be such central characters, I couldn't bring myself to truly care about them. I know that sounds bad, but it's true. The ending was unexpected, and dare I say, weird. The crimes were solved but it's what happens after that that had me like, huh? For real? Strange ending, but intriguing. I'd actually like to know what happens next. Not sure if there is a "next", but I would probably read a second book if there was one. Overall, this was an extremely well-written crime thriller. I can only hope to one day be able to write like this. I would recommend this book to readers who enjoy crime fiction. But if you're one of those who like a good dose of romance in your literature, then you'll probably have a hard time with this one, though I think you'd still end up enjoying it. Check out my interview with Lane!